Vaultz : Vaultz® is a wide range of fashionable security storage products that allow you to store, transport and protect the things that are important to you. Whether you are a DJ who needs a safe place to store CD's, an attorney moving around with sensitive case files, a construction worker with an expensive set of tools, or just someone who wants a good place to keep a nice camera, there is a Vaultz® product for you. The range represents an attractive array of storage products for just about anything you can think of. These products are sturdy, with reinforced chrome-steel corners, metal support rails, and offer security with combination or key locks. 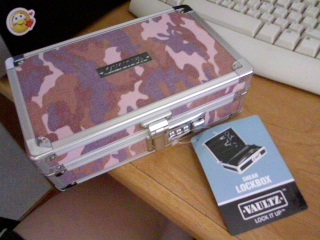 I received the Combination Lock box in Pink Camo $12.99 to try, review, and give one as a giveaway! - Be sure to check out the giveaway tab for a chance to win this! I was given the chance to choose what I style and Vaultz i wanted. It was a hard choice between pink cheetah print and pink camo. As you can tell from my blog I'm all about pink cheetah but i have recently discovered my love for more of a western style so i went with the pink camo. Vaultz has tons of styles and Vaultz to choose from! i will be giving one as a giveaway in the same print as mine. 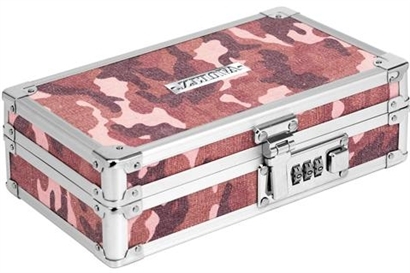 This box is a Shears box so you are a hair stylist you can keep your sharp tools and your private stashed styling tools out of harms way and under lock and key. 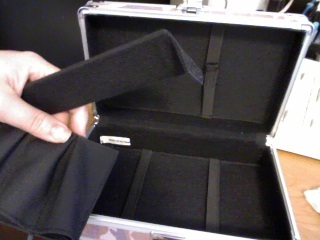 It has built in straps on the top and bottom a divider separating the bottom, and a 3 pocket shear case on top. As you can see in the picture the middle separator on the bottom has Velcro built in so you are able to remove the separator and you are also able to remove the 3 pocket shear divider also. In this case you are able to mix up what dividers you are needing add dividers or remove them all for more space in your Vaultz lock box. 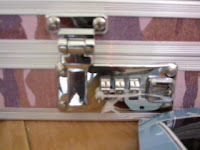 This lock box is a great way to stash whatever you need to be locked up. I found that my Vaultz is a great way to store my spare change that i have in coin rolls. 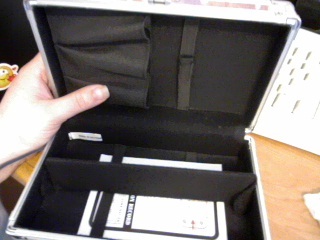 you can use this box a million and one ways. you are only limited to your imagination. ♥ I receive no monetary compensation for this review. I was provided a Lock Box to try and give my honest opinion.